I just wanted to let you know that I discovered your Clinical Traumatologist Certificate online and signed up for the first course this week. I did not sign up for all of the courses at once as I wanted to see the material first before I endeavoured to take the full plunge. As it stands, I am enjoying the Early Intervention Field Traumatology course. I am pleasantly surprised by the quality of the material and by the ease of its deliverance. I look forward to completing this course and signing up for future courses with a view to completing my certificate. Thank you for putting this material together. Courses has been excellent, I have learned much about trauma as well as some things about myself along the way through the reflective exercises in the course and completing the assessments myself. Thus far my experiences with the Traumatology Institute have far exceeded my expectations. Many thanks Anna, loving the course. I have just signed up for more courses as I cannot get enough of this! In the UK we are not really up to speed on specialised trauma therapy in general and my training with you is proving that. I changed the way I did things after my fantastic initial training and a client sent this through to my case handler. It has been an extraordinary journey to work through each module of the Clinical Traumatology Program. 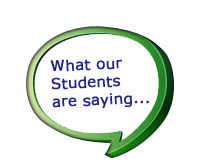 The materials are extremely well designed and the audio files on the learning zone clearly enjoyable- a very important aspect for a non- English native speaker providing care in the Netherlands and born in France like me. Also at any time, information, support and guidelines were given by the Training Coordinator! I gained in-depth knowledge about the psycho-bio-social sequelae of traumatic stresses. Lives matter. The Traumatology Institute has giving me a toolkit, that will make the difference in terms of resiliency, mastery and self-care. Thank you. I am loving your courses and learning loads from them. As a 5 year old girl, I experienced the horrors of war in Sri Lanka. This got me interested in the field of psychology. I earned … [a] degree … was seconded to work with demobilized child soldiers in Southern Sudan, conducted both individual and group counseling. Thereafter, I worked in Somalia with women and children. Upon returning to Sri Lanka, I worked [as a] Mental Health … Director … with Psychiatrists and Psychologists in Sri Lanka and developed many outreach programs. I want to mention how truly grateful I am to you for all the excellent learning opportunities you have made available for those of us who are interested in the field of trauma work. I find all the courses very useful, but … [Tool for Trauma – Trauma Practice] TI-204 is very useful, especially since I work with many trauma survivors. Thank you very much for your invaluable service. Thank you Dr Anna for these super-informative online courses in Traumatologia. I’m finding them wonderfully instructive and thought-provoking. After working on the TI 101, 102, and 104 today, I’ve also been reminded of Dr Michael Meaney’s (another great Canadian scientist!) important work in maternal care/touch, stress, glucocorticoid release and hippocampal neuronal death. Your courses are truly inspiring and motivating. I have been using the techniques I have learned from the program so far, and have seen great results. It is truly an honour to work with individuals who share such personal hardships … thank you for setting up such a wonderful institute. I am enjoying the traumatology work immensely! The trauma and stress courses were so useful with comprehensive information, scenarios, rich slide shows, theories, materials, reference, and so on…. Everything was terrific, tremendously valuable, highly encouraging, and well designed. I am currently in the Compassion Fatigue course and finding it very helpful. For the past year and a half I have been working on disaster recovery in High River. Many of the agency workers have experienced CF in varying degrees and I have been able to assist them using the tools from this course. I wanted to thank you for the opportunity to take part in the Community and Workplace Traumatologist program. I really enjoyed the course and will pass on my knowledge gained for years to come. I wanted to say how wonderful I think your materials are so far. I’m very excited to delve deeper into them. The program (Community and Workplace) is not only a perfect fit in terms of how I would like to approach any potential vocational endeavours … the information and learning is very, very clearly put together; is relevant; is so up to date in terms of treatment: and hints of the “First Aid” modeling for intervention is fitting in terms of my old life as a paramedic; some of the Incident Command information, for instance, is somewhat a review of things we needed to learn for the street for physical injury. Thanks so much – this training journey has been wonderful! The training has provided such valuable tools and information. I work with a very demanding/challenging population where there is a lot of clients presenting with trauma. I’m so grateful to the Traumatology Institute. I will be sure to keep an eye out for any other training opportunities offered. There are many complements that I can offer about your traumatology courses, but I especially wanted to say thank you for the Overview of Assessment and Intervention, Standards of Trauma Care, and Tools for Trauma: A CBT Approach courses in Traumatology. I am currently enrolled in a PhD Program in Psychology and your structured programs have assisted me in excelling in many of my classes, especially Cognitive-Affective Bases of Behavior and Theories of Learning. Your program offered the “lens” through which I was able to build a solid comprehension of trauma. Your courses are really companion courses that were needed to focus my psychology degree at the doctorate level. The courses are structured as if they actually have personal mentoring capabilities through your audio components. Thank you for such a well-designed program of studies. I am a Registered Nurse and my passion is trauma & violence prevention. I attended your online trainings for a couple of years to earn the Certifications for Clinical Traumatologist and Compassion Fatigue Specialist. I recently was notified that I will be receiving the 2013 APNA award for Excellence In Psychiatric Mental Health Nursing Practice … I wanted to share this with you because it is my belief that taking your training has helped me to become a better mom, leader, and nurse. My practice has improved and I feel so much more confident and competent as I speak with consumers, providers, treatment teams about recovery in nursing practice. I just wanted to take time to thank you for your skills and all you do. I like to think about how many lives you have impacted working with just this one nurse:) Thank You! Thanks to the Traumatology Institute for providing a valuable program on Compassion Fatigue [TI-107]. The education has broadened my knowledge and I will be able to apply this information in my personal and professional nursing practice. I highly recommend this program to all healthcare providers dealing with trauma victims, oncology patients, or any area that puts healthcare workers at risk for compassion fatigue. I am loving your courses and learning loads from them. As a 5 year old girl, I experienced the horrors of war in Sri Lanka. This got me interested in the field of psychology. I earned … [a] degree … was seconded to work with demobilized child soldiers in Southern Sudan, conducted both individual and group counseling. Thereafter, I worked in Somalia with women and children. Upon returning to Sri Lanka, I worked [as a] Mental Health … Director … with Psychiatrists and Psychologists in Sri Lanka and developed many outreach programs. I want to mention how truly grateful I am to you for all the excellent learning opportunities you have made available for those of us who are interested in the field of trauma work. I find all the courses very useful, but … [Tool for Trauma – Trauma Practice] TI-204 is very useful, especially since I work with many trauma survivors. I already feel like I have found a new “home” where I can do my own learning in a structured way. I applaud you and your colleagues for the work you do. I’m loving the material so far. I am actually living in Alberta and as much as I’d LOVE to come to Toronto for the course and to meet you in person, I’m going to have to stick to the elearning route for now. Once I’m finished the certification I’m really hoping that I can make it out to see you present! I’m really enjoying the courses so far and it’s very clear that you have a real passion for trauma. Thanks again for all of your help thus far! The Clinical Traumatologist program was my first experience with fully online training. Initially, I had my doubts as to whether online learning could offer as much as in-class learning, but soon discovered the advantages of this method. I appreciated being able to review the modules as often as I liked, as well as the convenience of working to my own schedule. I’ve deepened my knowledge of trauma counselling, and know that what I’ve learned from this program will benefit my practice greatly. Your online trauma classes have been my absolute favorite continuing education classes due to the organized and condensed format of the material, accessibility from home, affordable price, and exhaustive lists of therapeutic techniques. I have had a great experience with the e-learning program in clinical traumatology, at TIC. I loved the combination of theory and clinical work. It is a very rich program and the possibility to apply what you’re learning with actual clients, in your own work environment, is such a great asset. The textbooks and the slideshows are clear and very well documented, with the latest research. You can work at your own pace, which is very convenient when you have a full-time job, like me. Overall, I recommend this program without hesitation! I am really happy that I chose TIC for my training. Already persons can identify a change in my persona and approach to situations in counselling etc since starting this program. It’s a tremendous work you’re doing and I feel led to commend you on that. I really appreciated the hands on practical part of the program that included, especially, specific techniques for emotional containment and grounding or titration. For me, it really helped me to make sense of how the process worked, that is exposure and titration. I especially liked the autogenics exercise and use it with just about all of my clients, as it works great for stress and anxiety reduction strategies. Kay Noseworthy, Goose Bay, Canada. The Clinical Traumatologist on line training allows you to become familiar with all facets of Trauma work. Being recognized by the Green Cross Academy of Traumatology, it allows you to position yourself internationally with (COCA). The training presents in a comprehensive approach that allows you to learn or improve your Cognitive Behavioral Therapy skills, test your knowledge acquisition, reflect on your own personal practice and explore various treatment approaches. One of the aspects I personally appreciated was the readiness of the staff to help and the rapidity of their replies whenever clarification was needed. This is a fine organization which I highly recommend to whoever wishes to gain expertise in this field. 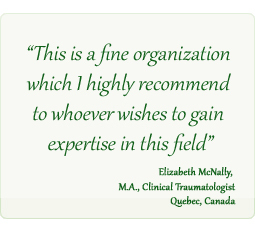 Elizabeth McNally, M.A., Clinical Traumatologist, Quebec, Canada. I don’t know the last time that I was engaged in training that was so complete, current and challenging. I have worked as a Mental Health Clinician for many years, and my passion is reducing violence and trauma. After completing this training, I am just now achieving a feeling of competence. I would like to thank Dr. Baranowsky for her passion, expertise, and dedication. Board Certified Psychiatric & Mental Health Nurse Clinician. Clinical Outreach Director for promoting awareness, victim empowerment (pave). Trauma Informed Care Advisory Committee (State of Wisconsin). The courses thus far are quite exceptional in their content! Advisor, Employee & Family Assistance, Iron Ore Company of Canada. I’m really impressed with the course offerings. Very comprehensive and the interactive software/quizzes are top notch. Counselor, Fairfax County Government ADS. I felt that the course material was prepared in such a way that allowed the learner to fully understand the various aspects of traumatology. The flow of the course material was readily understandable and the flow was outstanding … I felt that the exercises were clear and I would also state that actually completing the exercises was an important aspect in understanding and learning the material … Overall, I would state that your coursework was definitely challenging and any professional who studies or is employed in a trauma related field should complete the material. Social services supervisor, U.S. Government. The on line courses were both illuminating and practical. As a therapist I found the courses on clinical traumatology most helpful in terms of increasing my knowledge base and skill sets … more importantly, my clients will benefit the most as a result of what I have learned and will be able to apply when treating the traumatized. Great work… Dr. Baranowsky! I do not know when the last time I have felt so challenged, & stimulated. You all have done a fantastic job with these courses. I am so grateful! I completed the course and it was very educational, the work was straight forward and I enjoyed it. I look forward to doing more online courses. Thank you for your help and giving me this opportunity.